After a mild and prolonged fall season, the sudden and vicious arrival of winter came as quite a shock to Greater Moncton in December 2013. The first winter storm of the season arrived 15-16 December and three more would march through Southeast New Brunswick – including a lengthy ice storm – before month’s end. Temperatures were well below normal and not surprisingly snowfall was more than twice as much as usual. It’s hard to believe that only two weeks ago we had green grass in Greater Moncton. Now we are bracing for a fourth winter storm which Environment Canada says will bring a mix of snow and freezing rain to Southeast New Brunswick. 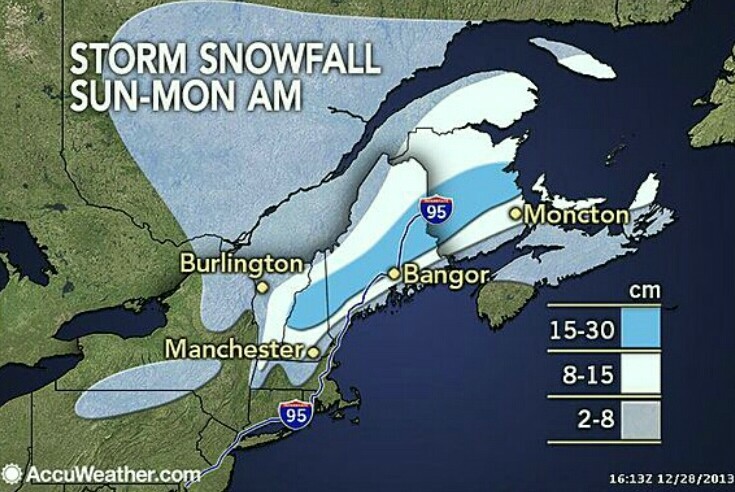 Higher snow amounts are expected in central New Brunswick before the system heads to Newfoundland on Monday. 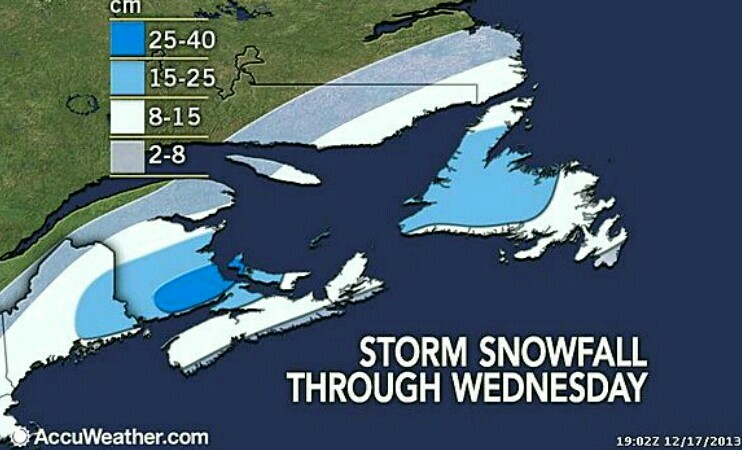 After this storm, an invasion of cold Arctic air will move into the Maritimes. 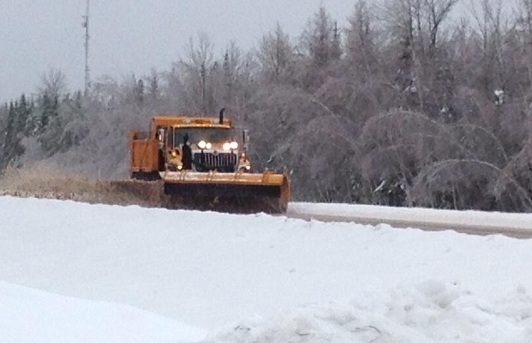 UPDATE – Moncton receives 22 cm snow; almost 30 cm falls in Grand Lake area. Power crews have been working around the clock since an ice storm impacted New Brunswick almost a week ago. The hardest hit areas have been St. Stephen and Rothesay – both experienced almost two straight days of freezing rain and ice pellets. As of late Sunday morning, some 10,000 power customers in the province were still in the dark and the Red Cross still has so-called warming centres open in schools and community halls to help residents. Some believe the extended outages could have been prevented if trees had been properly trimmed around power lines but crews say that work often comes with local resistance. My drive from Moncton to Truro on Christmas morning was a bit scary at times with snow and poor visibility especially through the Tantramar Marsh. Road conditions were tricky with the passing lane snow covered for most of the trip. Fortunately traffic was light and drivers on the road were slowing down for the conditions. 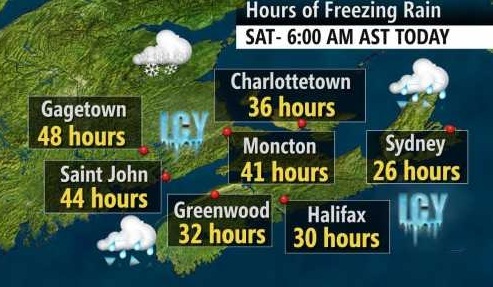 An incredible amount of ice has coated much of New Brunswick with Greater Moncton hit with more than 41 hours worth of freezing rain and ice pellets as of early today. 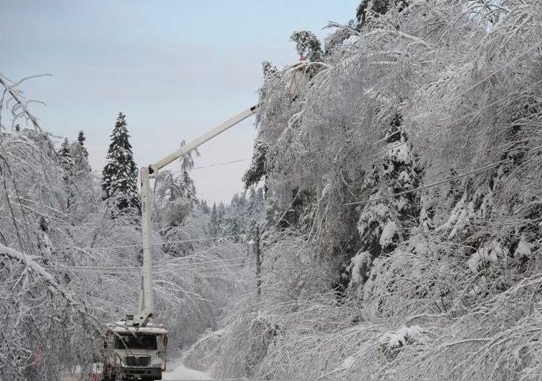 NB Power crews have been scrambling to try and bring the lights back on for Christmas Day. At the outage peak more than 50,000 customers were in the dark and although the numbers keep dropping, many may not have their electricity back until Saturday. Warming centres have been opened in schools and community halls for those who may need them. Greater Moncton and Southeast New Brunswick has recorded more than 34 hours of freezing precipitation (freezing rain, ice pellets) as of 4pm ADT Monday. A freezing rain warning has been in place since Saturday for the region. At least 20 cm of snow and freezing precipitation have accumulated since yesterday according to Environment Canada. Numerous flights have been cancelled or delayed, roads are treacherous and thousands have lost power due to the relentless storm. 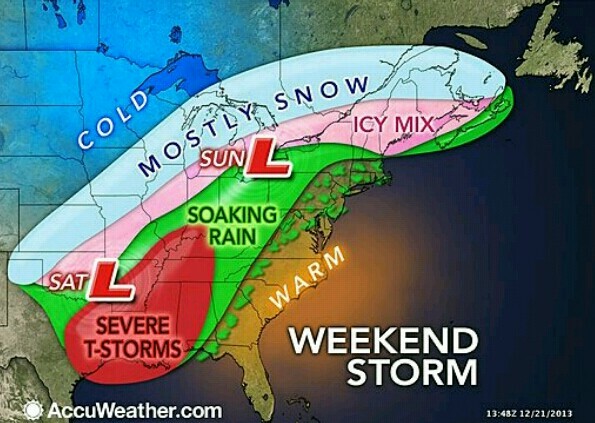 Winter storm three – a messy mix! Freezing rain and snowfall warnings remain in place for Greater Moncton and Southeast New Brunswick in the wake of the third, major winter storm in only a week. Environment Canada reports 5 mm of rain and freezing rain fell and 2 cm snow fell on Saturday. 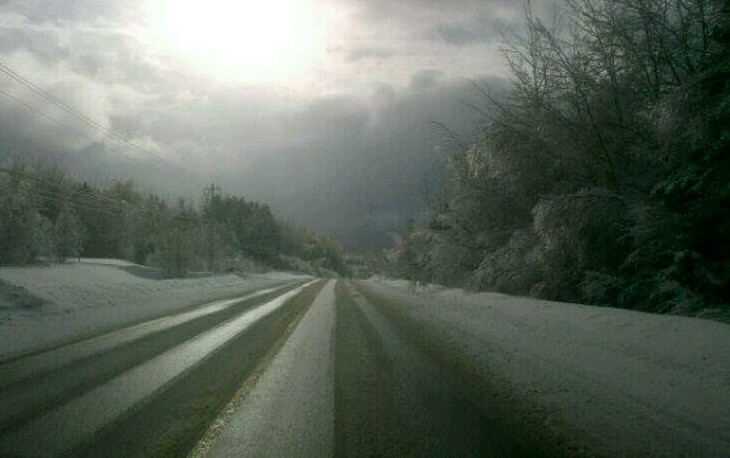 An additional 15 cm of snow is expected to fall today with rain along the Fundy coast. Numerous flights have been cancelled and driving is treacherous throughout the region with police urging motorists to use extreme caution on the roads. Winter officially arrived today at 1:11pm ADT but wintry weather in New Brunswick really began earlier this month. 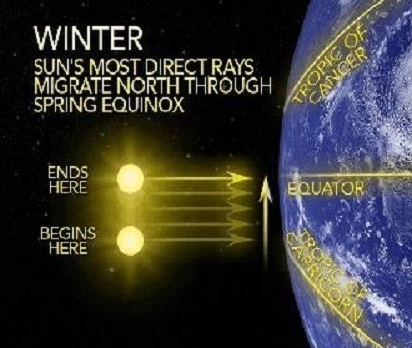 The winter solstice occurs when the sun is directly over the Tropic of Capricorn. In the weeks that follow, the sun’s most direct rays will migrate northward and reach the equator on the first day of astronomical spring. The south-north migration of the sun in the sky is caused by the tilt of the Earth’s axis and the movement of the Earth around the sun. Just three days after New Brunswick’s first major snowstorm of the season comes another blast of winter. Environment Canada reports 28 cm of snow fell in Greater Moncton with winds gusting up to 50 km/h creating blowing and drifting snow. Schools were closed and due to treacherous driving conditions, RCMP were not recommending travel on the Trans Canada Highway throughout the region. 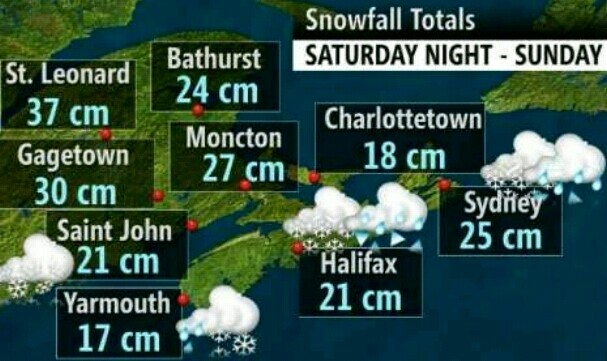 New Brunswick’s first major snowstorm of the season dumped snow and even some freezing rain in Greater Moncton. The snow began to fall around 8:30am Sunday and continued until the evening with strong winds gusting from the NE up to 72 km/h creating blowing and drifting snow. Flights were cancelled, ferries stopped running, driving was treacherous and even many stores and businesses closed for the day.